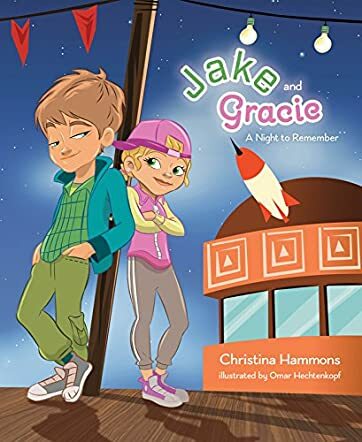 Meet siblings Jake and Gracie in the story Jake and Gracie: A Night to Remember by Christina Hammons. Though Jake is three years older than Gracie, they are very close and have a lot of adventures together, but they always recollect them in a different way. They both go to the carnival and are having a great time until the hot air balloon ride. Gracie remembers it as a night where they played it safe because of Jake's unwillingness to be adventurous. She beat her brother at the balloon pop stand and won a giant stuffed monkey. Jake screamed like a baby during the hot air balloon ride and Gracie could not believe her brother was behaving like one. Let us read the story together to learn how Jake remembers that night. The topic is original and refreshing and I like the way the author has written a story based on each one's perception on their experiences. The illustrations are bright and captivating and pull readers into the carnival scene where Jake and Gracie are. It is a perfect story to help children understand how each person can have different views about the same thing or event or experience. It is interesting to note how different the recollection of each sibling is of the same night. It is a good story to read out to children to help them understand how it is fine to have different outlooks on the same thing and still enjoy the event. Many readers will find the story of Jake and Gracie real and palpable, especially if they have siblings. In fact, they can have a session in the classroom of getting children to speak about their views on the same event and I am sure it will be a fun activity.